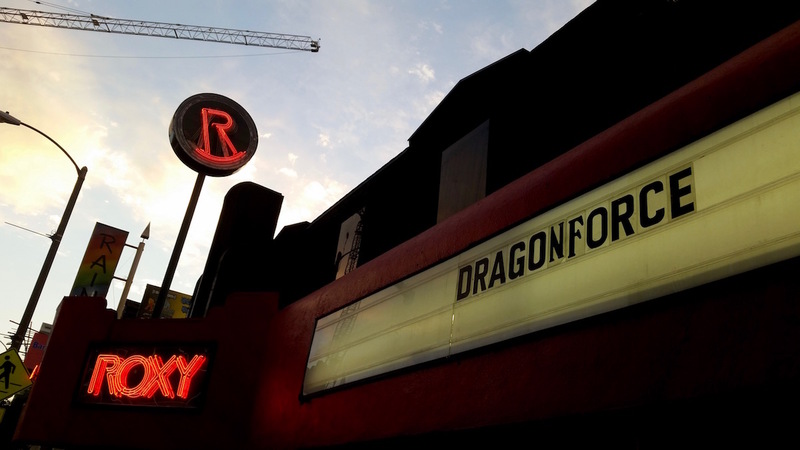 July 8th 2017, The Roxy, West Hollywood CA: Following the release of their seventh studio album ‘Reaching Into Infinity’ earlier this year via Metal Blade Records, power metal icons DragonForce began their world tour with shows in Japan, Australia and New Zealand, and arrived in North America in July to set foot on a 3-week trek, with support act Once Human. 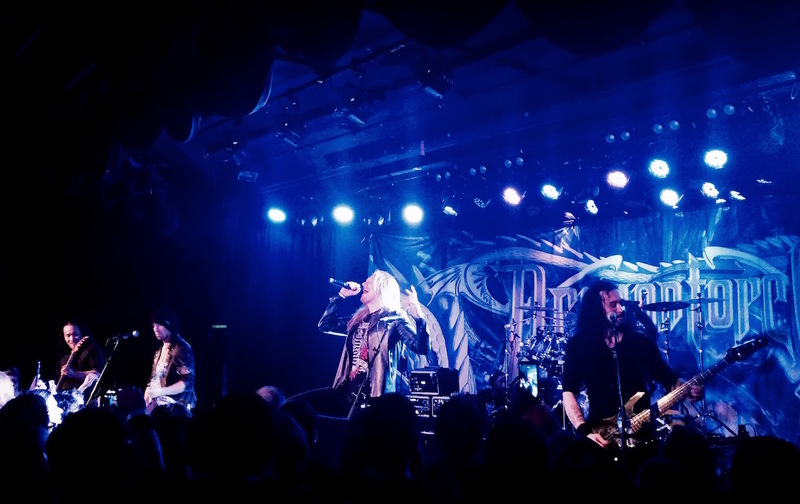 After the first show in San Francisco, the band arrived to a completely packed house at the Roxy in West Hollywood, for an event that had been sold out well in advance. DragonForce has a great fan-following in the LA area and have always played in front of highly energetic crowds, but on this occasion even they were pleasantly surprised, as DragonForce fans, power metal enthusiasts and guitar nerds from all over town gathered in huge numbers and made the band feel at home by greeting them with deafening cheers throughout the show. But before that, opening act Once Human took the stage at 8:30 PM and made a largely positive impression with their set. This Los Angeles based extreme metal band released their second album ‘Evolution’ earlier in 2017, a huge step up from the first one, and in many ways, ‘Evolution’ is their real debut, as they underwent a change in musical direction to go heavier and more complex and technical. They put forth a solid performance here, as frontwoman Lauren Hart left the audience in shock with the sheer brutality of her vocal delivery. She has certainly emerged as one of the best new extreme metal vocalists, but as good as the vocals were, her stage banter was awkward at best, with a strange sense of humor, and there is room to improve in that aspect. This band also features renowned metal producer Logan Mader (also a former member of bands like Machine Head and Soulfly), and while Hart grabbed all the attention, Mader laid down his guitar parts excellently, as did the other members of this band. 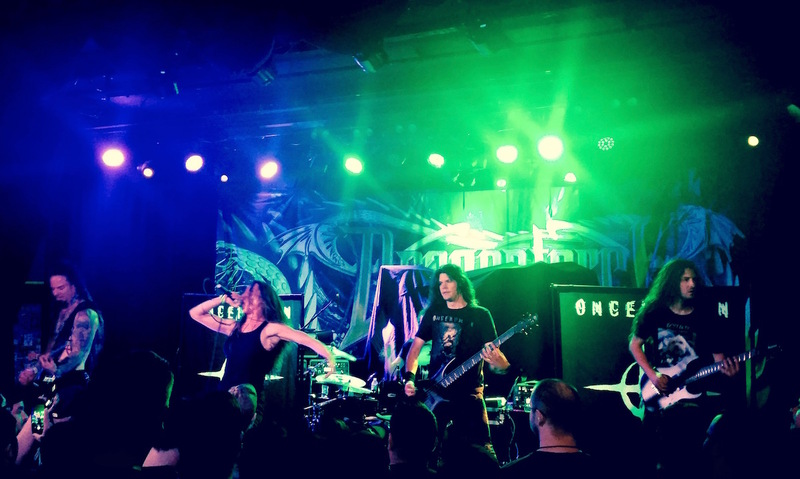 It is common for power metal fans to want a power metal band opening for the likes of DragonForce, but it’s sometimes better to get to taste a different musical style and flavor from the opening act(s), and Once Human proved as much. Good set, bad jokes. Promptly at 9:45, the curtains engulfing the Roxy stage were lifted, and it was time for this packed house to get excited. It was a bit strange to have the 90-second ‘Reaching Into Infinity’ intro playing on the PA after lifting the curtains, and it would have made far more sense to roll the intro before the curtain liftoff, and have the band already on stage by that time. But that was just about the only thing DragonForce did wrong at this show, because what ensued was a set so splendid, it not only vindicated the loyal support of the diehard fans, it also left critics and skeptics flabbergasted, including those who had chosen to write off or stop following the band over the past few years, for one reason or another. This incarnation of DragonForce showed that they still have what it takes to retain their crown as kings of all things power metal and guitar shred. But this set wasn’t merely about that, and there were more layers and variations to it than one would have expected. The band got the set off to a very strong start, and through a blend of new and old tunes compiled and intertwined together in a perfectly flowing order, they moved from strength to strength. It would have been quite boring and monotonic to watch a band play 90-plus minutes of shred, and thankfully this DragonForce set isn’t along those lines and presents some songs and segments that provide a break from the fast and furious. This only further raises the impact the fast-paced songs make. ‘The Edge of the World’, an 11-minute epic off of the new album, was, in all honesty, the highlight of the set. To witness a band like DragonForce excel at incorporating death metal into their sound (complete with harsh lead vocals) heightens the respect and admiration one has for the band, for trying new and different things at this stage of their career when they could very easily get away with not doing so. DragonForce’s rendition of ‘Ring Of Fire’ was also one of the most enjoyable portions of the set, and compared to the San Francisco set list, they even played an extra song in the encore just for their LA fans. The jam segment with bassist Frederic Leclercq on guitar and vocalist Marc Hudson on bass was another highlight, as musicians switching instruments is not something you get to witness every day. The entire set was enjoyable and there really were no dull moments, owing not only to the songs and the performance, but also because of Marc Hudson’s banter with the crowd between songs. He came across as a complete natural, and Lauren Hart could certainly learn a lesson or two from him. It must be said that DragonForce fronted by Hudson is a far better live band than they ever were with ZP Theart. It is also worth mentioning that DragonForce’s keyboard player is not performing with them on this run and they’re touring as a five-piece. They are avoiding keyboard-dominant songs, as a result. This may be a blessing in disguise because this could be termed as a more rock n’ roll version of the band, and there is no doubt that they can hold the fort as a five-piece. Hudson remarked repeatedly that the band was absolutely amazed and blown away by the response from the crowd. The chorus parts were sung along loud, the circle pits were rolling as fast as Herman Li and Sam Totman’s fingers on their fretboards, and the collective cheer after every song was roof-shattering. Los Angeles crowds are notorious for being low-energy and hard to please, but contrary to popular belief, crowds here give it their all and more to any band that deserves it. We just have higher standards, that’s all. The sold-out show and the packed house rendered the Roxy’s air-conditioning quite ineffective on this occasion as the building was no less than a sweat box, and the heat was only turned up by the combination of the band’s scorching performance and the energy of the crowd. It is extremely hard to strike the perfect balance between stellar musicianship and entertainment value, but DragonForce pull it off with effortless ease, and still are some of the finest musicians and entertainers in the world of heavy metal. Whether or not you’re a fan, you are highly encouraged to catch DragonForce on their ‘Reaching Into Infinity’ world tour if it comes anywhere near you.